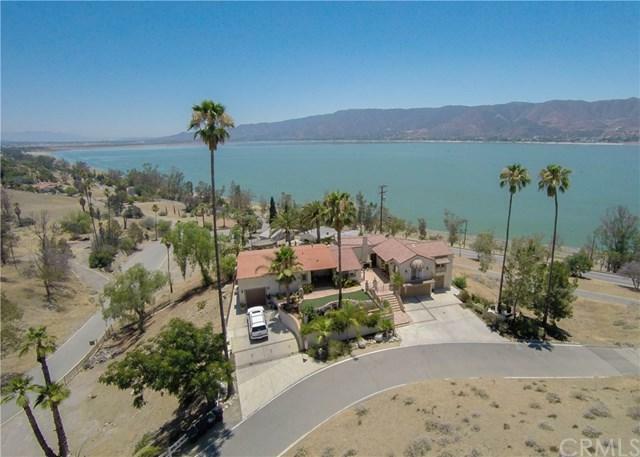 A NEW WORLD OF PRIVACY AND CONVENIENCE AWAITS YOU IN THIS ONE OF A KIND BEAUTIFUL MEDITERRANEAN / SPANISH STYLE HOME PERCHED ON A HILL IN THE DESIRED COUNTRY CLUB HEIGHTS AREA, WITH BREAT TAKING VIEWS OF LAKE ELSINORE AND THE ORTEGA MOUNTAINS. THIS HOME HAS BEEN COMPLETELY UPGRADED, BUT AT THE SAME TIME HAS RETAINED THE CLASSIC STYLE OF A BYGONE ERA. TV ROOM COULD ALSO BE USED AS A FOURTH BEDROOM OR AN OFFICE. HOME HAS TWO SEPERATE GARAGES AND A SMALLER ONE OR MOTORCYCLES OR TOYS. THE BACK PATIO AREA OVERLLOKING THE LAKE HAS A PEBBLETEK SALTWATER POOL WITH BEACH ENTRY, SEPERATE SPA, AND A COMPLETE PALAPA BAR, PERFECT FOR ENTERTAINING. OH, AND DON'T FORGET THE GAME ROOM ADJACENT TO THE POOL AREA WITH ITS OWN SEPERATE ENTRY. HOME SITS ON A LITTLE LESS THAN A HALF ACRE, AND HAS A COVERED RV PARKING AREA. TOP OF THE LINE KITCHEN APPLIANCES AND OTHER UPGRADES MAKE FOR YOUR DREAM EXPERIENCE. ONCE YOU SEE THIS HOME YOU WILL FALL IN LOVE. Sold by Rudolph Lacayo of Century 21 Preferred.